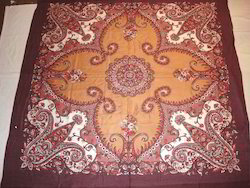 We also offer digital printed scarves in various fabric qualities. This is a camouflage printed scarf printed on 100% Modal scarves . The fabric is soft and has got a nice feel. Also offering a wide range of other patterns/designs. We also offer digital printed scarves in various fabric qualities. Apart from printed scarves, we also carry a wide array of woven and jamawar scarves & shawls. 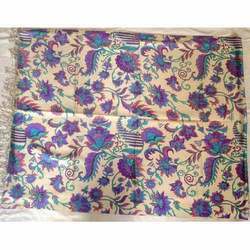 We are offering silk printed shawls (FC-SH-17) in a very good quality of Silk. These silk printed shawls are made with high-end quality 100% Silk. We can offer these in various printing designs. 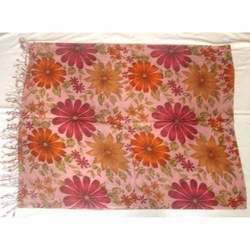 We are offering 100% printed woolen stoles. We can also customize the printing designs as desired by the customers. We present an astonishing range of Print Wool Pashmina Shawl, which is available in a huge variety of fabrics. Our collection of Printed Shawls has been crafted out with intricate patterns, alluring designs and fascinating colors. The printing is done either manually or by machines using advanced technologies. Offering a wide & Exclusive Range of Printed Scarves & Shawls in a variety of designs & patterns. Customization of designs & pattern also offered. This is an Animal printed scarf printed on 100% Modal fabric. The fabric is soft and has gfot a nice feel. A perfect for daily use. This is an Animal printed scarf printed on 100% Wool fabric. 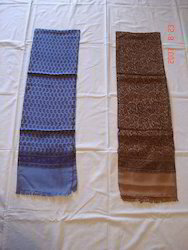 This is a soft and high quality of woolen scarf and a perfect scarf to carry. Offering a wide & exclusive range of Silk Printed Scarves and cotton Printed Scarves & Shawls in a variety of designs & patterns. Looking for Screen Printed Scarves ?